A total of 123,696 students are learning Karen literature in government schools in the Ayeyarwady Region in the 2018-2019 academic year, according to the regional education office. There were only 91,871 students learning Karen literature in the previous 2017-18 academic year in the Ayeyarwady Region and the number of students has increased up to 31,825 in this academic year. “Many Karen people reside in the Ayeyarwady Region. 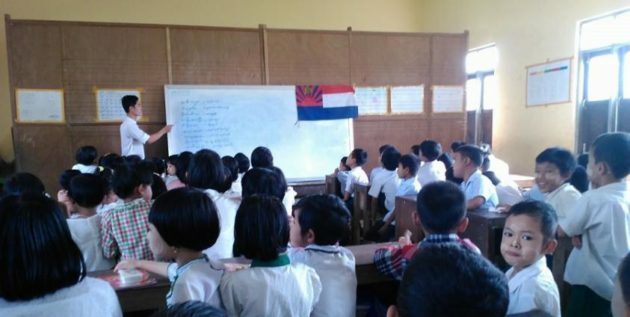 Since the government has officially allowed [the teaching of Karen literature], there have been a rise in government schools teaching Western Pwo Karen literature, S’gaw Karen literature and students [learning Karen literature] this year compared to last year,” Mahn Thein Kyaw, deputy director of the Ayeyarwady Region Education Office, said to Karen News. A total of 74,274 students are learning Pwo Karen literature in 934 schools, 49,422 students are learning S’gaw Karen literature in 650 schools this year. There are 2,218 Pwo Karen teachers and 25,754 S’gaw Karen teachers, according to statistics from the Ayeyarwady Region Education Office. Statistics from the regional education office showed that there were 52,200 students and 1,440 teachers in 721 Pwo Karen schools and 39,671 students and 1,256 teachers in 536 S’gaw Karen schools in the Ayeyarwady Region during the previous 2017-18 academic year. Other ethnic literature classes are also taught in the region during this academic year and there are 1,622 students learning Asho Chin literature and 3,736 students learning Rakhine literature.